Gaseous streams containing LPG (liquefied petroleum gases: Ethane, Propane, Butane, Pentane...) occur naturally in natural gas and crude oil solution gas, and also as by-products of a variety of refinery processes (gas fractionation units for instance). The purpose of an LPG unit is to process light hydrocarbons (C1-C5) into economically valuable component streams. Available processes for this separation include those based upon cooling and refrigeration of gas, oil absorption and the cryogenic processes. A combination of these processes may also be considered. The market price of LPG, the gas richness (propane and heavier hydrocarbon content), the desired output, and the plant capital and operating costs will in fact determine which process to choose and the required level of recovery for each component. 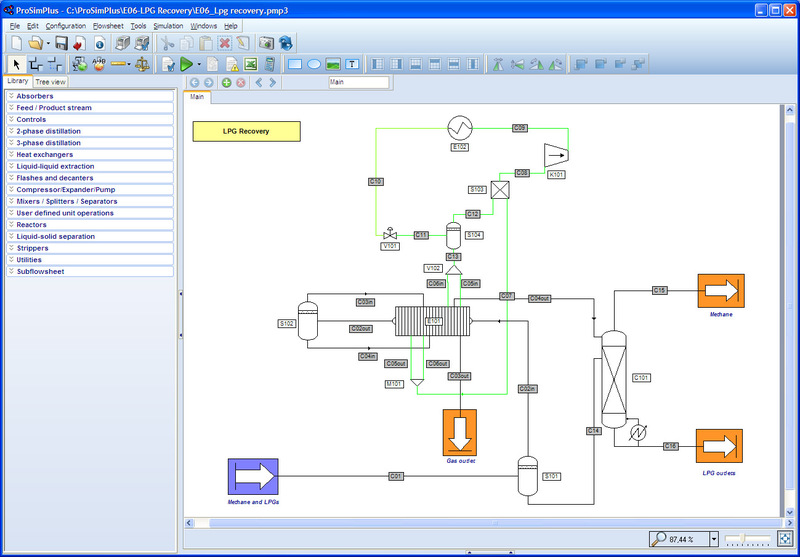 Rigorous process simulation is today widely used to design and optimize LPG recovery processes. An example of LPG recovery process using a cooling system was built with ProSimPlus. The process presented hereafter is using a gas with a propane refrigeration loop (green streams). This process is particularly inter-connected and includes several recycling loops. Additionally, beside the implementation of the absorber module (acting as the deethanizer) and of the refrigeration loop, this process uses the plate fin heat exchanger module of ProSimPlus, a particularly complex unit operation. This type of exchangers can include as many as 10 different hot and cold streams which renders the modeling and the associated calculation particularly complex. This example is meant to provide a starting point for advanced simulation of such process by presenting a set of components with their physical properties, and unit operation modules with their specific interconnections. This example can be used to analyze and understand the main areas of the process and shows one way to model these particular areas and their interconnections. Additional areas of investigation can also be the testing of new equipment configuration to enhance production yield and analysis of energy efficiency. Generally speaking, advanced simulation software like ProSimPlus enable pre-size equipment, run troubleshooting and debottlenecking analysis. Their ability to run in-depth analysis and what-if scenarios allows solving these types of problems within a reduced time and a minimum investment. It is to be noted that this particular model is not intended to be used in equipment detailed design, manufacturing or even producing engineering documents without further review by a process engineer.